I hope you are having a happy Christmas and New Year season. I just wanted to say how much Sue loves the Cabin Stool you painted for me to give her as a Christmas present. It was quite a puzzle finding somewhere to hide it until the 25th, but I managed it (under my office desk, hidden behind an attaché case) and Sue was completely unaware that I been in touch and had collected the stool before Christmas. Sue believes, as I do, that the stool is simply magnificent, thank you for making such a wonderful piece. Cor! I knew it would be good, well done mate! Thank you! I didn't expect to hear so soon especially as you had your course to oversee. Plenty of time left yet, but I will come and collect by arrangement with you. Can't wait to show Lyn. Bevis was hoping to have a drive out to pick the can up and put your face to a name. Bevis says that he will be passing your name and contact details onto the boating community in the west midlands if that is ok with you? We thank you again and look forward to your response. You are a genius Terence. It looks fantastic mate! It will look absolutely fabulous. We hadn't expected you to have done it within 48 hours. Will contact you later in the week re pick up. Awesome. Many thanks for the planters they were fantastic, made for an unusual present, we are sure that Ethel and Colin will love them. Look forward to seeing them on your web site. We opened the box, stood back and said ' Wow ' ! The can is so detailed and beautiful, we are thrilled to bits. It has also been great to talk to someone with so much enthusiasm and love for their work, a factor so reflected in the finished result. As expected, Mary was delighted with the special watering can. I attach a couple of photos of us pretending to use the can in the garden - we have not yet summoned up the courage to use such a beautiful item for real! The packages arrived today unscathed. Here is a shot of the finished door panels. I think they turned out very well indeed. Your art is brilliant. If we get back to England perhaps I will carry them with me and hang them on the back of our hired boat! Last time we took our own flag now I will bring my own doors!! Just to let you know received flower troughs - safe and sound - thank you, they are really lovely and I'm really pleased with them. They will make a great Xmas present for Dave. I absolutely love it... When I spoke to you I knew you were good and a true craftsman but I never envisaged just how talented you really are. Thank you so so much it is exactly what I wanted for my brother and more besides. I can confirm that we received the beautiful barrel safe and sound and I finally managed to catch up with my big bruv last weekend. He is always like a big kid when it comes to presents! He was absolutely over the moon. Thank you once again for making a very special present for a very special brother. Here is a picture of his beloved present (according to his wife he has been showing the barrel off to all and sundry) in situ. We love the milk churn - those cartoons are great! We can't wait to pick them up now. They are absolutely beautiful. Your website is brilliant. What a talented artist you are - keep up the good work. You obviously have a deep feeling for the canals, which I can totally understand. Well what can I say? They are beautiful; I could not be more pleased with them. I have just had a new green house built and they are to take pride of place on a new shelf for my collectables. Once again I would like to thank you so much for the items, you are one very talented artist. The packages do look very attractive wrapped in the paper you use; perhaps they get special treatment for that reason -- the parcel with the milk churn looked as though it hadn't even been shipped yet! I would like to congratulate you on your accreditation into the Waterways Craft Guild. I enjoyed perusing your website and vicariously travelling with you along the canals. Many thanks again for your reply, and of course for the lovely milk churn now gracing my kitchen! Here are a couple of photos of the panels on the bow door. The no-nails worked really well. I am really pleased with them. I am pleased to tell you that my can has arrived safely, many thanks indeed. The artistry is a credit to you and the pike looks very fit for action now! I found the extra castle scene on the bottom of the can and conclude that you must absolutely love painting. For work of this quality, my wife and I agree that you should be charging your customers more than you do. Very well done indeed, and once again thank you. I look forward to meeting up with you when we next come to Braunston. Looks wonderful Terenceï¿½ Square and Compasses magnificent! Thanks for the pictures the Buckby looks fantastic, I could even identify the aeroplane as a Pitts Special! You now live only 10-15 mins from me so I can pick the can up myself when its finished, it would be nice to meet you both. Thanks for that, it looks exactly what we're after - brilliant! It was really good to meet you and your wife and we appreciated your hospitality despite the pouring rain. The panels are wonderful. I stuck them on with bluetack just to see what they looked like before bringing them home to let them harden a bit before the proper sticking up. Thank you so much. In the short time they were on the doors they attracted praise from the towpath! Thanks again. See you again I promise. Delighted with the present from my Daughter & Son in Law - your roses & castles stoolï¿½ It will look great on "Rainbowchaser" I will be the envy of the cut. The tables look absolutely brilliant. You are so clever. I can't wait to put them in my living room! I know they will be admired by many people and who knows might even bring you more orders. Just to say that I had a look at the items you have for saleï¿½ I want to say how much I like your work- it is truly beautiful and a credit to you. You really are a master craftsman. Thank you again for your great website - it was a pleasure to visit. 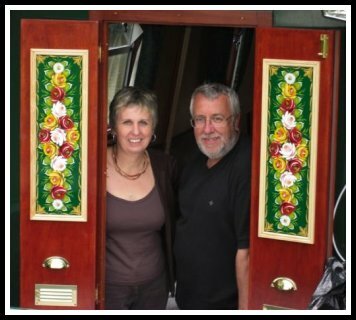 The coal hod looks great on our boat, but I havenï¿½t yet dared to put coal in it! Iï¿½m worried that I will spoil it. I think this stool is absolutely gorgeousï¿½ The stool arrived on Tuesday and Julie phoned me straightaway. She is absolutely delighted with it and thinks it is very beautiful. She has now asked me to forward to her your website so who knows you might have gained another customers. Thank you very much again Terence for all your hard work. We had a lovely cruise the other weekï¿½ Lots of people commented on how good everything looked so of course we told them who the artist was! Wow, what can I sayï¿½? We are both pleased as punch with your work. To put it another way 'it is beautiful'. You have taken our remit and made it into a thing of beauty. Both me and my wife would like to thank you from the bottom of our hearts. 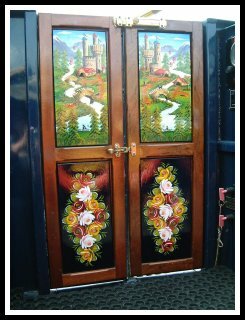 I am trying to teach myself to paint narrowboat roses and castles. Your site states you will teach. I would love to learn from you because your work is some of the BEST I have ever seen. What an absolute pleasure to meet you todayï¿½The Buckby can is fabulous. 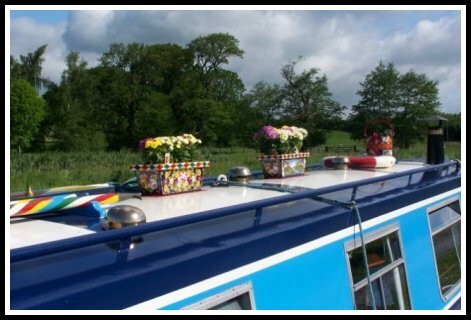 The trough looks fantasticï¿½ We are absolutely delighted with it and it has now taken pride of place on the boat (complete with plants of course). Just to let you know the artwork has arrived safely, in spite of the delays caused by Royal Mail strikes! You certainly wrapped the panels well. I'm really happy with your work, & will get them fixed on my cabin doors ASAP. My wife loved the milk churn so I just wanted to say thank you for doing such a great job of it! It looks stunning and fits in perfectly with the other pieces she has. Itï¿½s lovely and you are very talented! Looks great on our balcony overlooking the limehouse cut canal. It is absolutely fantastic!!!!!!!!!!!! It brought tears to my eyes! Thank you. ï¿½ I wondered if I could call in and pick it up. It would be lovely to meet you and see your work. They have received the stool and gather they are just delighted with it. Hopefully they will pass on the artist info to their narrow boat friends. Well what can I say I have just rang Chris we have both been on you site and what can I say!!! Bloody lovely!! What beautiful work, love the boat coming out of the tunnel, and the swan well !!! bloody amazin! I'm not usually stuck for words but my life you sure know how to paint. If you ever want to do any training in the future count me and Christopher in. See you both in a couple of weeks. This is just gorgeousï¿½ JUST what I wanted. What can I say? You've done it again! No mistaking when I'm happy with something is there? I am very pleased with the watering can; I think it's lovely. Thank you for being so prompt and doing a wonderful job. I have looked at your website and am very impressed with your professional artwork, I wish mine was up to the same standard. That is first class. Thank you. Thank you to everyone for your lovely comments! Images subject to copyright laws. Please email canalarts@yahoo.com if you wish to use them. 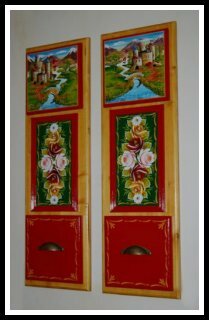 All items shown on this website are for decorative purposes only.